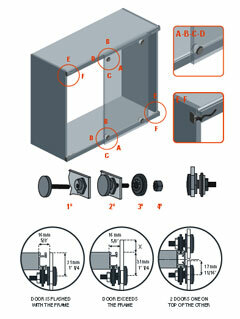 4 Points Sliding system for inline glass doors installed overlay the opening. Ideal for furniture applications. One box with all you need to install 1 door, just order the track, the fascia and you are ready to go. Stoppers are installed inside the track. More doors can be installed one on top of the other.